Tayport are looking to retain the trophy they won last term. Tayport will be hoping to get back into action tomorrow as they look to start their campaign to defend the GA Engineering Cup. The club will be on the Canniepairt with close neighbours Broughty Athletic providing the opposition, in the first round of the tournament. It is only four weeks since the Fed’ last visited Tayport, on Super League duty, when they ran out 4-2 winners. The side should go into the game with fresh legs due to their scheduled fixture at the weekend being postponed. In common with most fixtures, Tayport’s trip to meet Bo’ness United was called off because of the adverse weather conditions - but not until ’Port were en-route to Newton Park with news of the postponement coming through when the team bus was at Perth. This was a source of great frustration, as the game had earlier been given the go-ahead. The closure of the Forth Road bridge had been another consideration, but there should be no such traffic problems this weekend, as the East Region fixtures all involve teams playing local opposition. In their last encounter with Broughty, Tayport were 3-0 down before coming roaring back with two goals from Kris Rollo. Scott Finlay then hit the bar from the edge of the area. 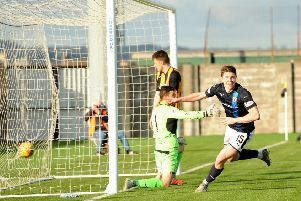 Having come so close to a leveller, there was late heartache when former Tayport captain Grant Lawson netted Broughty’s fourth goal. Ironically, Lawson lifted the GA Engineering Cup last season, when in Tayport colours, as the Canniepairt outfit lifted the inter-regional Trophy at Tannadice, when they defeated North End. So, Tayport go into the tie as cup holders but will face a Broughty side who have bolstered their squad in the last month, having signed ’Port’s Ryan Suttie. He could join Lawson, goalkeeper Iain Ross, wide man Jake Mair and forward Bryan Duell in lining up against their former club tomorrow, although Mair and Duell are likely to start on the bench. Kick-off at the Canniepairt is scheduled for 1.30pm and will be played to a finish.